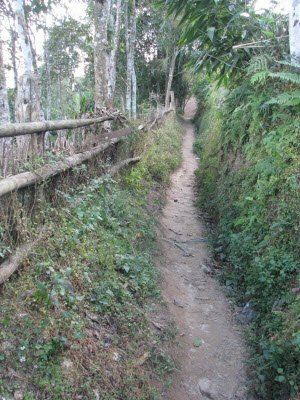 Trail through the Lost Tea Garden of Pedong. 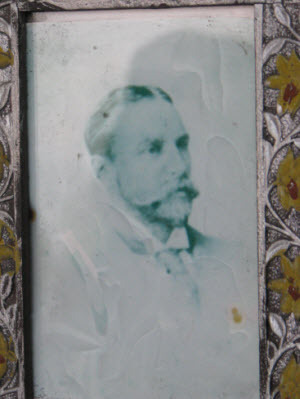 James "Jimmy" Ranger, descendent of the founding missionaries. Mt. Kanchenjunga, the tallest peak in India. Old growth tea bushes from the Lost Garden of Pedong. Grave stone of the former superintendent of Doars Tea Estate, successor to the first commercial plantings. Many believe that it was the British who first brought tea to India. In fact, India had been consuming tea produced in China since the 7th century — more than a thousand years before the British established their first gardens in Assam. Long before loose tea as we know it was created, compressed cakes and bricks of tea from Southern Yunnan and Sichuan Provinces in China traveled by caravan to Tibet and then onward to far-off lands. In the monasteries and nomad tents in Tibet, one can still find this kind of tea in use. Tea was an expensive luxury for some, and an essential staple for others. The cost to bring it all the way from China, both in currency and in effort, was often beyond the point of profit. Losses in cargo, human and animal resources and onerous taxes and tolls among other things, had to be recouped in the selling price. For the tea merchant, these challenges posed formidable obstacles in running a successful business. Their journey ended in Kalimpong. Little known to people outside of North Eastern India, let alone the rest of the world, the town has served for hundreds of years as a junction point and conduit for trade between China, Tibet, Nepal, Bhutan, Burma and India. It was the nearly impossible destination of the brave caravans that brought tea and other goods from remote Southern China along the ancient Tea Horse Road. The arduous journey took months to complete and passed through hundreds of miles of inhospitable and often precarious terrain. Many a pack-mule and handler met their ultimate fate on the trek. The bulk of the tea consignments from China were intended for Tibet’s capital city of Lhasa. Even so, it was a longer distance from Yunnan’s tea producing districts of Xi Shuang Ban Na (shee shwang ban nah) and Dali (dah lee) than from Lhasa to the Indian border. Eventually, some enterprising Chinese realized that if the tea was made in Kalimpong and shipped to Lhasa, months of time and cost could be saved. And so it was that tea planting and production began in India, hundreds of years before the British East India Company began planting. The Chinese set up tea production in the lower reaches of the Himalayas, taking advantage of the ideal weather and environment for growing tea. Actually part of Bhutan at that time, gardens were set up in Algarah, Pedong and Lava along the Jalep La – the road to Lhasa. Most of the details of when and how these teas were produced were carried away by the misty clouds that haunt the hills. There remain only a few “old timers” who carry the oral tradition and heritage of the area. In the early 1800’s, during a time of openness in India, Tibet and China, foreign influence, though by no means rampant, became more tolerated. As a bustling land port, Kalimpong experienced a thin stream of outsiders, arriving for trade, adventure or to evangelize their faith. Roads were improved. Infrastructure was enhanced. A Scottish Presbyterian Church was built, which still stands. 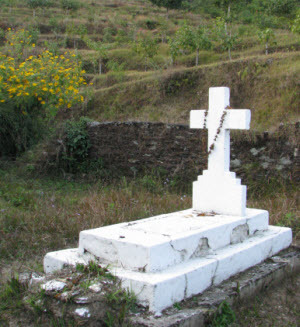 Originally coming as missionaries to promote Christianity, a group of Swiss Priests who also recognized the value of tea, established a tea garden named Damsang in Pedong, on the outskirts of Kalimpong. Migrating from their original base in Hele, Nepal, these “Swiss Fathers” as they are still known, propagated their faith, converting many of the local people to Christianity. They also added to the number of faithful by eventually marrying local women and remained in the area for the rest of their lives. In the years that followed the Swiss (and the British) expanded and mechanized the tea growing centers. Estates were set up, producing “tea that was formed in compressed ball shapes,” recalls a local elder named Chottu Fulla. This compact form was more efficient for transporting the cargo to Lhasa. The Damsang tea estate was eventually reorganized into the Doars Tea Company which owned the Kumai tea estate, also on the trade route. In fact, was once a road stretching 677 miles through Kumai estate and connecting the port of Chittagong in Bangladesh with Lhasa, Tibet. Sporadic clashes along the border following the political upheaval in Tibet culminated in the 1962 Indian/Chinese war that left 3,500 dead and 2,500 wounded. The passes into Tibet were closed. Domestic civil unrest in the 1980’s further jeopardized commerce and the tea garden was gradually abandoned, its bushes left unattended or cut down. Records of the early years and figures on tea processing and the volume of tea produced went up in flames during the conflict. One still sees the ruins of old buildings, decimated by time and civil war. 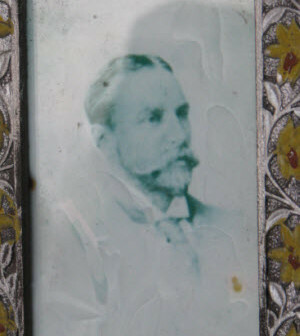 The grave of Leslie Ranger remains on the site with a telltale inscription in stone revealing the family’s connection with tea. It identifies Ranger as the Superintendant of the “Doars Tea Company.” His resting place is just a few steps from where the old Damsang tea factory used to stand. 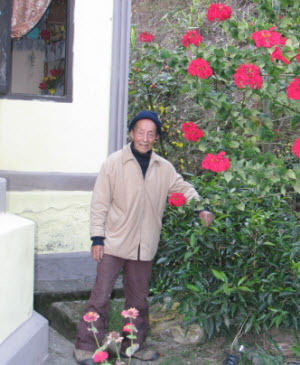 The exact whereabouts of the once prolific estate are known only to a few locals who tell stories about the “days of tea in Pedong.” In December we traveled to the site where we met the last descendant of the Swiss missionaries. He lives on the grounds of the former tea garden. James (Jimmy) Ranger is weathered by years. 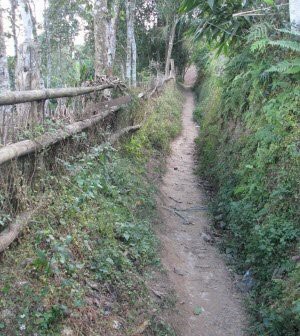 He and his wife walk the narrow paths once lined with flushing tea bushes. According to Ranger, tea has not been made here for nearly ten years. Before then only a small amount of leaves were plucked, primarily personal use by the local people. Every so often, some tea would be sold from hand to hand. 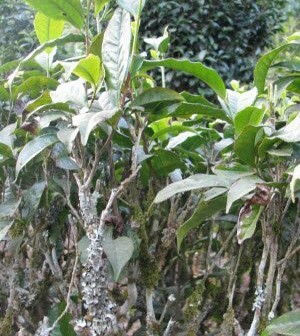 Some of the tea bushes still exist as of this writing. A few were recently pruned. Others are rooted precariously in the path of a new stone road and will surely be pulled out. I was accompanied on my trip by tea businessman and historian Rajiv Lochan. Together we ventured into this nearly forgotten place to discover if there was any truth to the legends that tea was once grown in the hills. We set off on our quest from Darjeeling, under the watchful gaze of Mt. 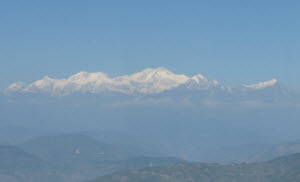 Kanchenjunga. The four hour odyssey took us through rolling hills covered in green tea bushes, across the majestic Coronation bridge and along the powerful Teesta river. We wound around precarious hair-pin turns, through bustling Kalimpong town, plied our way up through alpine forests and stopped at the aptly named the Silk Route Inn to refresh and meet up with a man named Pedan. It was Pedan who took us to meet “Jimmy Uncle” as he is known. We set out on foot up a wide path. The gravel paving gave way to dirt and narrowed to almost shoulder’s width. Pausing at a clearing to catch our breath we turned around to see the mountain range behind us. “Over that ridge is China” our guide informed us. Only those with special permits dare approach the border which is still manned by soldiers. Indeed, the Mountain Division of the Indian Army has a base nearby. In the clearing also stood the ruins of the old family house. We continued up the trail spurred on by a sixth sense that there were tea bushes nearby. Our hopes were rewarded when a six foot “wild” growing tea bush was spotted about 10 feet off the path. A few more steps and the answer to our quest was fully revealed. Abandoned tea bushes dotted the hillock that led to the cottage where James Ranger and his wife live. Sitting on the front porch, which was decorated for Christmas, Ranger shared the story of his family history. He proudly pointed out the portraits of his grandfather Fr. Leslie Ranger and other fore bearers. After spending nearly an hour answering our numerous questions, he strolled with us back down the path, tenderly touching some of the leaves of the tea plants that remained. The sun was low in the afternoon sky as we said our goodbyes. During the four hour night-drive from the hills down to Siliguri, we were tired but excited. The thrill of the day’s adventure echoed through our minds. Pleased with our discovery, we felt grateful for our good fortune and honored to have touched a piece of tea history that was nearly forgotten. In 2006 the Nathu la (pass) was formally reopened, once again allowing trade and traffic to flow between India and Tibet. Kalimpong has since become a tourist destination, known for beautiful scenery, abundant plant life (especially orchids and rhododendrons) and religious studies. It is hoped that the old Jalep la pass will also reopened which will further revive the local economy. Will there be a resurrection of the old tea gardens of Pedong? Who can say, but telling the story will keep the tea alive for those who enjoy the adventure that swirls in their tea cup.